While the Haiti amputee football team did not make it to the trophy presentation stage by the soccer ball, they did via the paint brush! 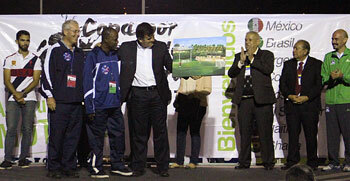 As a token of appreciation to the Mexico Cup of the Americas Organizing Committee and its principal sponsor Proan, Haitian amputee player and artist Francillon Chery presented a painting of the soccer practice venue to Proan founder Manuel Romo. Dr. Fred Sorrells, manager of the Haitian team joined those on stage in applauding the art presentation. The Haitian team made a lasting impression on the host city by demonstrating their amputee skills for school groups and sharing their inspiration stories with local residents with disabilities. Well done, Team Haiti! 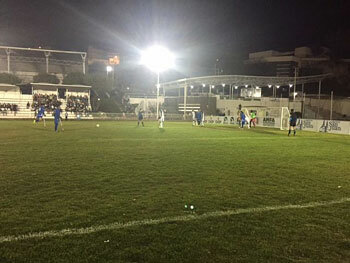 The first afternoon game of the tournament found the Haiti reserves playing against the recently formed national team from Costa Rica in the beautiful town of San Juan de Los Lagos, an hour’s drive from Guadalajara. Haiti scored the first goal and lead 1-0 at the half. The Haiti squad found their rhythm in the second period scoring some beautiful goals. The score was Haiti 5 Costa Rica 0. 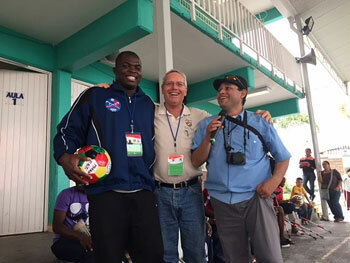 The Haiti national amputee football team came to Mexico with the dual purpose of competing in the Cup of the Americas tournament and championing the impaired in schools and local communities. Team members have shared their stories of overcoming loss of limbs from the 2010 earthquake, police violence, mudslides and vehicle accidents. Their public service has been applauded by the Organizing Committee, school officials and thousands of interested students. Professor Mora translated into Spanish as Dr. Fred Sorrells shared the incredible story of Haitian goalkeeper Emmanuel Ladouceur’s earthquake survival with hundreds of students today. Ladouceur was buried under rubble for four days before being rescued. These stories of faith and perseverance are having an enormous impact upon the way people with disabilities are perceived here. Following the presentation of the player stories in school assembles, students intensely pursue the team members for autographs on paper, balls, articles of clothing, and even their arms. The amputees are certainly enjoying their new found “rock star” status. Since Haiti received a bye in today’s scheduled match, the team was able to visit another school in the afternoon. On Wednesday night, Haiti played with zeal, determination and fair play against a very strong and disciplined national team from Mexico. 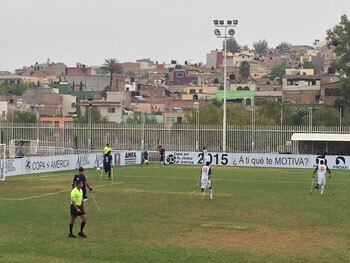 The host nation scored the first goal during the initial period, and the score remained 1-0 at the half. Despite numerous on goal shots, the Haitian squad could not equalize the score. Mexico made a second goal late in the second period to win 2-0. Despite its youth and inexperience, the Haitian team has drawn rave reviews from other delegations and spectators for its tenacity and speed. This bodes well for the selection of the next team for the World Cup of Amputee Football.